Cancer is a tap on the shoulder and shouldn’t be treated with a war mentality. It’s important to note that Dr. Thomas Lodi, Dr. Nathan Goodyear and An Oasis of Healing do not believe in the Allopathic viewpoint that there is a war on cancer. We don’t view the human body as a battleground for conventional cancer treatments such as chemotherapy and radiation. An Oasis of Healing believes in treating people dealing with cancer staying within the biological laws of nature. We use alternative cancer treatments that stop producing cancer, target cancer and build and strengthen the immune system. Our treatments and therapies challenge the cancers cells at a metabolic level which they are unable to respond to and handle and hence, die off. This is an update to show how excess body weight increases the risk of developing cancer. A new study, Global patterns in excess body weight and the associated cancer burden, casts serious doubt that cancer statistics are moving in a positive direction! According to the authors of this study, approximately 4% of worldwide cancers can be attributed to the global epidemic of excess body weight (excess body weight = overweight individuals + obese individuals). So, are we winning the war on cancer, quite clearly, no, we are not! In the U.S. alone, the percent of individuals with excess body weight is 6.9% and is expected to grow. Many cancers (at least 13 known as of today) are known to be linked to excess body weight i.e. pancreas, breast, ovary, prostate… The increasing trend in excess body weight of the world’s population suggests the incidence of cancer will continue to rise and the current conventional treatments for cancer will continue to falter. This study, however, does present a silver lining. It points to the fact that cancer and cancer risk are open to influence. 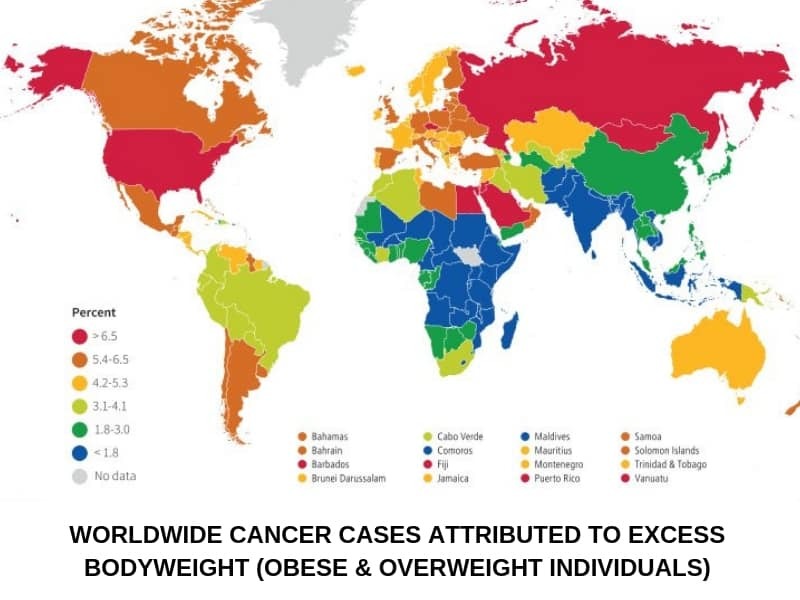 If excess body weight is associated with 4% of the worldwide cancer rate (6.9% in the U.S.), then at least 4% (or higher) of the worldwide cancers are open to possible influence, intervention, and prevention. A healthier lifestyle and a reduction in excess body weight can reverse the trend in the global cancer rate. Cancer is not a de-facto by-product of our genes out of our control as once was thought. Cancer is a by-product of the lifestyle choices we make interacting with our genes and genetic expression, which places cancer and cancer risk under our control through the lifestyle choices that we make every day.